San Francisco fire crews evacuated residents of the 300 block of 15th Avenue between Geary and Clement after report of a gas leak on Tuesday, August 18, 2015. 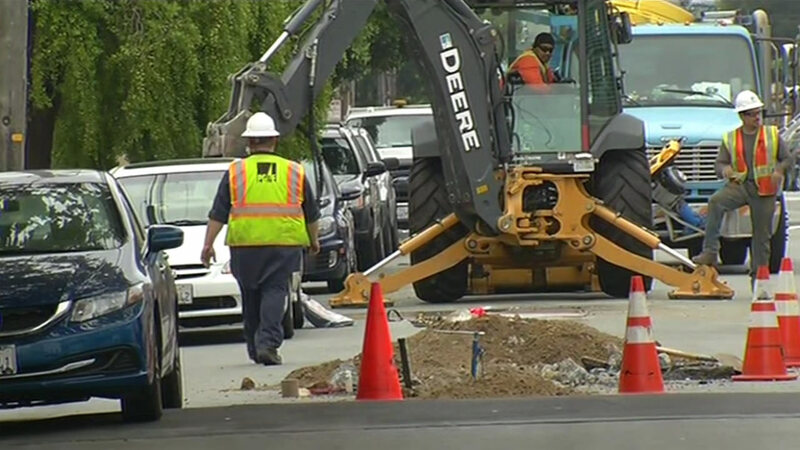 SAN FRANCISCO (KGO) -- PG&E capped a gas leak in San Francisco's Richmond District that forced the evacuation of more than 100 residents for about two hours this morning, a PG&E spokesman said. The leak was reported at 8:14 a.m. in the 300 block of 15th Avenue between Clement and Tacoma streets. PG&E crews requested that the block be evacuated as a result of the gas leak, fire officials said. The flow of gas was stopped at 10:13 a.m. and the 120-130 evacuated residents were allowed to go back home, PG&E spokesman Nick Smith said. Repairs to the damaged line are underway. PG&E is investigating what caused the leak. Anyone with concerns about lingering gas odor has been asked to call PG&E at (800) 743-5000.